Alexander Raskatov: 5 Min. Aus dem Leben von W.A.M. I've been reading, lately, that postmodernism is dead, but CDs such as this one show that its burial is a little premature. It's a compilation of two night-themed serenades by Mozart, a "toy symphony" by his father, and three Mozart-inspired works by composers from the former Soviet Union. 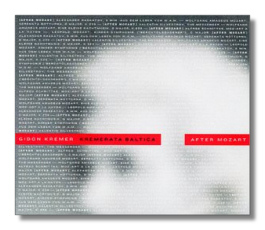 Gidon Kremer calls it an attempt "to set Mozart in the frame of our own time." From Peter Sellars's productions of the Da Ponte operas to Bobby McFerrin's and Chick Corea's interpretations of two piano concertos, Kremer is hardly sailing unknown seas. What makes this CD worth hearing, however, are the works by Alexander Raskatov (a first recording) and Valentin Silvestrov. Raskatov, born in 1953, purports to give us a snapshot of five minutes from Mozart's life. Scored for violin, strings, and percussion (here, played by Andréy Pushkarev), Raskatov's work is almost unbearably innocent; nothing so naïve could be anything but knowing. The nectar is sweet – cloying, really – and the listener is tempted to perch on the edge of this little musical pitcher plant, only to fall inside and be digested. The more carefully one listens, the more one is disturbed by these five minutes (5:11, really). The "problem" is that no one living in a civilized nation in the year 2001 can identify with the legendary purity of Mozart's music, and when it is served to the listener on a silver platter; the shock is no less hard for being so subtle. Valentin Silvestrov (b. 1937) had a minor "hit" a few years back with his Symphony #5, a work of frighteningly post-nuclear uneventfulness and quiétude. The Messenger - an allusion, I suppose to the ghostly figure of legend who delivered the commission for Mozart's Requiem - is hardly less lost in the Elysian Fields. It was written in memory of the composer's wife, Larysa Bondarenko. Blown in by the sound of synthesized wind, this is half-heard music; we are cautioned not to pump up the volume. As if from another room, we hear strings and piano work haltingly, inconclusively through a Mozartean text. The music, lost in a dream, seldom goes quite where we think it will. Bondarenko, now clothed in a gown from the eighteenth-century, gestures at her husband like Euridice in a powdered wig. The Schnittke work ("Mozart fragments… put through the compositional equivalent of a food processor," in annotator Bob Gilmore's words) is familiar enough to need little comment here. At the end, the audible footsteps of the departing musicians are a nice touch. Suffice it to say that Kremer and fellow violinist Eva Bindere make it into a provocative experience, but not a deep one. The two Mozart serenades are played enthusiastically, with no attempt made to replicate period style. The idea of interpolating jazz and other modern-style cadenzas into the last movement of the Serenata notturna is an eyebrow-raiser; I can't vouch for more than that. In father Mozart's Kinder-Symphonie, the toys have been modernized: the cuckoo and the little drum have given way to the microchip. I admit to finding the idea and its execution cute – I think of Mozart in Tokyo's Ginza district - but possibly only because the musical value of the Kinder-Symphonie is so slight to begin with. Try this for the Raskatov and Silvestrov works and you'll probably stick around for the rest.